Attension Optical Tensiometers are versatile instruments used in R&D, and quality control to characterize material surface properties and interfacial interactions between gas, liquid and solid phases. Also known as contact angle goniometers or contact angle meters, they are instruments of choice to characterize surfaces. The Attension Optical Tensiometers are ideal for a wide range of applications and completely modular enabling users to customize the system to fit their research needs and budget. 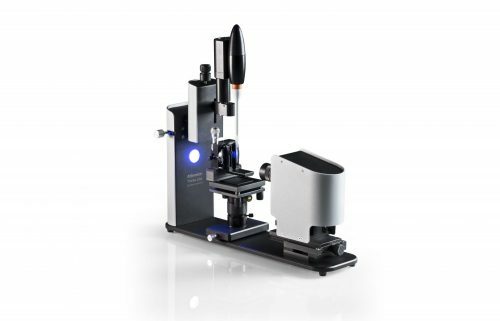 Advanced and versatile contact angle meter for accurate measurements of static and dynamic contact angle, roll off angle, surface free energy, 3D surface roughness, surface tension, interfacial tension and dilatational interfacial rheology. Theta instruments are completely configurable from basic entry level manual systems to fully automatic top of the line systems for enhanced reproducibility. Attension Theta Topography for roughness-corrected contact angles. Attension Theta High Pressure for enhanced oil recovery research. Attension Theta Pulsating Drop for interfacial rheology characterization. Compact and accurate contact angle meter for simple measurements. The Theta Lite is an entry level system for basic research. It comes equipped with a manual sample stage, fixed zoom camera, and either a manual syringe or 1 or 2 automatic pipette dispensers. 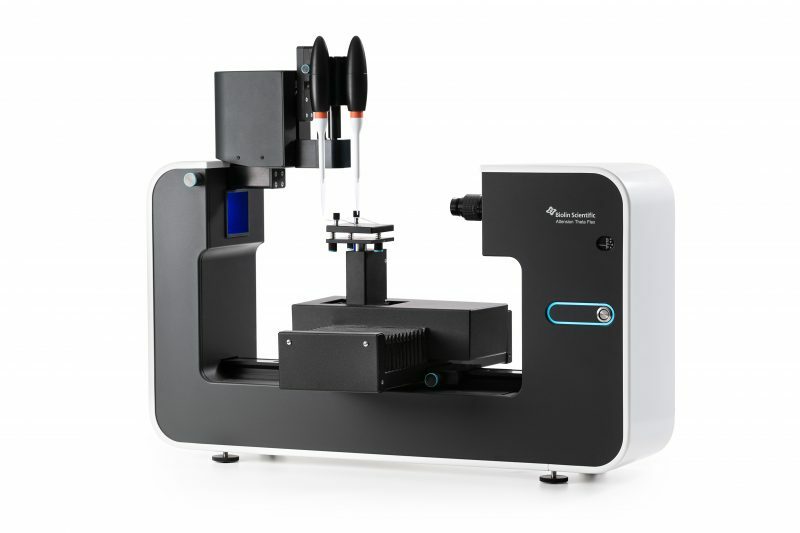 Theta optical tensiometers are able to perform a complete range of automated measurements, which makes them a highly versatile instrument in research, industrial and QC laboratories. Measurements include: static contact angle with the sessile drop, captive bubble and meniscus methods, dynamic contact angle with the tilted drop and sessile drop methods, surface free energy, surface/interfacial tension with the pendant drop and reverse pendant drop methods, 3D surface roughness with the fringe projection phase shifting method, and interfacial dilatational rheology with the pulsating drop method. The Attension Theta optical tensiometer records drop images and automatically analyzes the drop shape. The drop shape is a function of the surface tension of the liquid, gravity and the density and humidity difference between sample liquid and surrounding medium. On a solid, the drop shape and the contact angle depends on the properties of the solid (e.g. surface free energy, topography). The captured image is analyzed with a drop profile fitting method in order to determine contact angle and surface tension. Surface free energy is calculated by performing contact angle measurements with several known liquids. As an optical method, the measurement precision of optical tensiometers depends on the resolution of the image, the lighting, and the analysis software. Attension Optical Tensiometers utilize a high quality monochromatic cold LED light source to minimize undesirable sample evaporation as well as give the user fully adjustable light intensity. Image quality is guaranteed by a high-resolution digital camera, quality optics and the accuracy of the drop fitting method employed by the OneAttension software. Easily upgradeable from a fully manual configuration all the way up to the most advanced fully automated system and all the parts are plug-and-play. Water-in-oil emulsions are formed in restrictions such as choke valves and pumps during oil production. This water must be separated out to attain adequate oil quality. Asphaltenes are soluble polyaromatics that naturally occur in crude oil and are a major emulsion stabilizer. To study the role of asphaltenes at oil−water interfaces, measurements of interfacial rheology using the pulsating droplet technique at different frequencies, different concentrations with Theta and OneAttension software can be done. The importance of asphaltenes will increase in the future as a significant portion of the new oil reserves are heavy crudes with an asphaltenic nature (oil sands, heavy oils). Nano-engineered functional surfaces are studied for a wide range of applications. For instance, super-hydrophobic self-cleaning coatings can be utilized in solar cells and windows. Contact angle is the method used to define the super-hydrohobicity and functionality of these novel surfaces. Various types of artificial materials are used as medical implants. The surface properties of the implant determine its interactions with the surrounding host tissue. Phys­icochemical properties of the surface, such as wettability and surface topography, are of prime importance for the optimization of adhesion, spreading and proliferation of cells. Contact angle and surface roughness measurements are therefore commonly utilized to evaluate biocompatibility of implants.